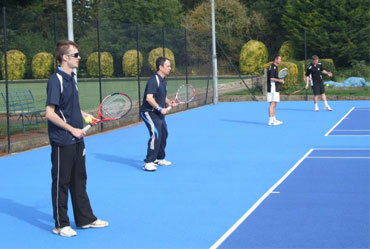 There are 3 Adult Social Tennis sesions a week, Tuesday and Thursday afternoons 1pm-4pm and Sunday evenings 7pm-9pm. All standards and newcomers are welcome - so come along and give it a try! Players of all abilities are welcome to mix in, we play mostly doubles with the occasional set of singles, depending on numbers. If you turn up and all the courts are busy, don't worry, each game will be shortened, and players will be swapped in and out, to make sure members are never waiting too long. It’s a great way to socialise and meet new friends. Primarily intended for stronger club players, adult club nights take place on Tuesdays from 6pm until 10pm. If you're looking to just turn up and play, our club nights are perfect. This session runs on a Wednesday evening starting at 7pm. The first hour is taken by one of the club coaches, they generally set up drills to help focus on different aspects of the doubles game. Most people generally stay on after the first hour to try and put what they've been shown into practice. There is an additional charge of £4 per person for this session. This session runs on a Thursday evening from 6pm to 10pm and is run by the team captains. Non team players of a good standard are welcome to attend but will be mixed in by the captains as they construct matches to suit the team practices they require. Junior coaching takes place from 4pm until 8pm on Monday, Wednesday and Friday and from 9am until 1pm on Saturday. The coaching programme is run by head coach, Bianca Pallatt. The groups are split by age group and cater for 5-18 year olds. Please see “Coaching” for further details. This is an occasional session that runs on a Friday evening from 7pm to 8pm. This session is run by the Head Coach, Bianca Pallat. There is an additional charge of £3 per person for this session.